Have you noticed a tissue growing over your eye? Has your eye gotten red and irritated where this tissue is located? Is this growth affecting your vision or even blocking your vision? Do your eyes feel dry? You may have a Pterygium. It has been described as a degenerative or inflammatory process. However, it can also be a proliferative process since it can grow and encroach further into the cornea as shown in the picture above. Pterygos is the Greek word meaning wing. It may form from a Pinguecula which is a yellowish bump on the conjunctiva (the transparent tissue covering the white part of the eye). 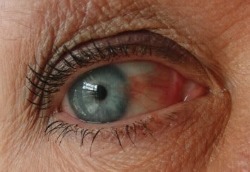 It is a lesion that looks like a raised, whitish, triangular-shaped wedge of fibrovascular tissue, whose base lies within the conjunctiva tissue and whose apex encroaches on the cornea. Because of its encroachment on the cornea, it can cause corneal warpage leading to high Astigmatism and decreased vision. Although the exact mechanism for the formation of the lesion is based on many theories, it does appear to be multi-factorial. UV-A and, especially, UV-B appears to be the most significant factor. This may explain why disease rates are higher in countries that are hot, dusty, and dry, and these rates are vastly greater in populations near the equator. Rates are also significantly greater in persons who spend a great deal of time outdoors, especially without sun protective glasses. Growth factors: Some of the treatments employed mimic those used for cancer growths. It is readily visible without any special instrumentation. Most Pterygia occur nasally (on the white part of the eye closer to the nose). A routine eye examination is usually sufficient to diagnose the condition, especially with the use of a slit-lamp microscope. Men are somewhat more likely to have Pterygia than women. There may be a racial predilection for people of African descent to have Pterygia more frequently than whites. A Pterygium can be confused with a Pinguecula, especially if the Pinguecula is large. However, Pinguecula are more yellow in color and generally do not encroach beyond the limbus (the boundary between the cornea and the conjunctiva). Also, Pinguecula lack the wing-shaped appearance of a Pterygium. Traditional surgery used to result in recurrence rates as high as 50%. Newer techniques can lower recurrence rates to less than 1%. Placement of a graft in place of the Pterygium that will serve as a barrier to new growth. At the conclusion of the Pterygium excision, the eye is patched and shielded over a fluoroquinolone antibiotic overnight. non-steroidal anti-inflammatory drops to manage pain. The use of new techniques has decreased complications, and even when they do occur, they have been easy to manage. The most common complication in younger patients is an eye pressure spike following use of the steroid eye drops.